And the winner is… or not? 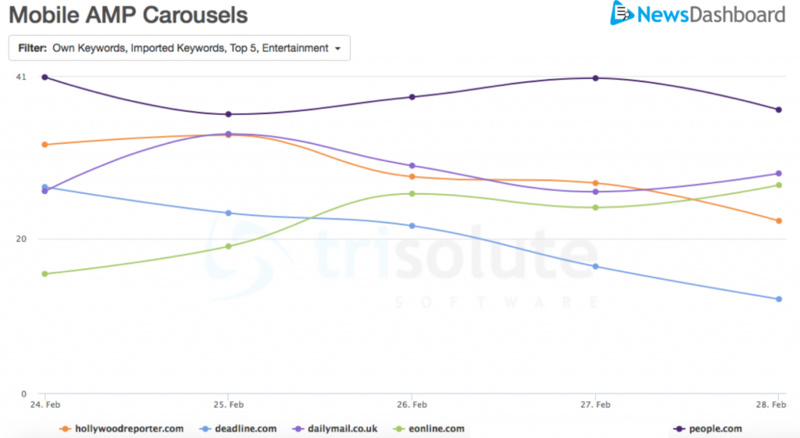 While there was a slight confusion with the winners at the Oscars last weekend, there is non with our data – and with that we present for the second time the rewarded news outlets for the Oscars 2017 in Google and Google News. We have arranged a ever updating keyword set “Oscars 2017” (see below for the examples) around the big event, but we have also decided to include the imported keywords from the Google News category “Entertainment” for this event – so that we do not miss one thing while it is buzzing live on the internet. This analysis is split into two segments: one long-term view on the results for the mobile SERP (02/24/2017 – 02/28/2017) to catch up on the pre- live and after event coverage and one short-term view for the desktop News Boxes (02/27/2017 – 02/28/2017) to catch up on the latest news reactions. The first segment includes the top 5 publishers for mobile News Boxes, AMP Carousels and single-source carousels/Publisher Carousels. Afterwards, the second segment will show us the desktop News Boxes. We start off with the mobile News Boxes. An UK based publisher is again a strong player in the USA’s top 5. The clear winner regarding visibility the long term visibility surrounding the Oscars in all mobile News Boxes is: people.com – with a visibility level starting at 29.38 percent and up to 34.45 percent. The second award goes to a British publisher, a more and more common occurrence in the US as we have seen, but still a bit astonishing and remarkable. Dailymail.co.uk start on third position with 23.40 percent visibility and while people.com‘s visibility drops on Saturday to a minimum, dailymail.co.uk reach their second best score with 29.07 percent. Though, they reach their maximum score on Tuesday with 30.44 percent. Another award goes to hollywoodreporter.com. They start off great on second position with 26.73 percent on Friday and while they also stay strong on Saturday, they lose an important part of their visibility over the next days. In conclusion, they reach their minimum on Tuesday with 19.34 percent. Next in the top 5 is eonline.com. Their graph takes the opposite curve of hollywoodreporter.com. Their lowest point is on Friday with 14.84 percent and climbing up the ladder, they reach their highest point on Tuesday with 25.03 percent. On fifth place we find deadline.com with a slightly downwards progressing curve and visibilities between 10.36 and 20.30 percent. Now we will move on to the award ceremony for the mobile AMP Carousels. AMP Carousels make up a big part of the mobile News Boxes, so it is not surprising to see that we see the same top players as already mentioned. But as News Boxes and AMP Carousels do not share everything, the curves are slightly different. Again, we have people.com as the most awarded publisher, but the gap to the second publisher has expanded in comparison to the first picture and their absolute visibility percentage is higher with AMP Carousels. 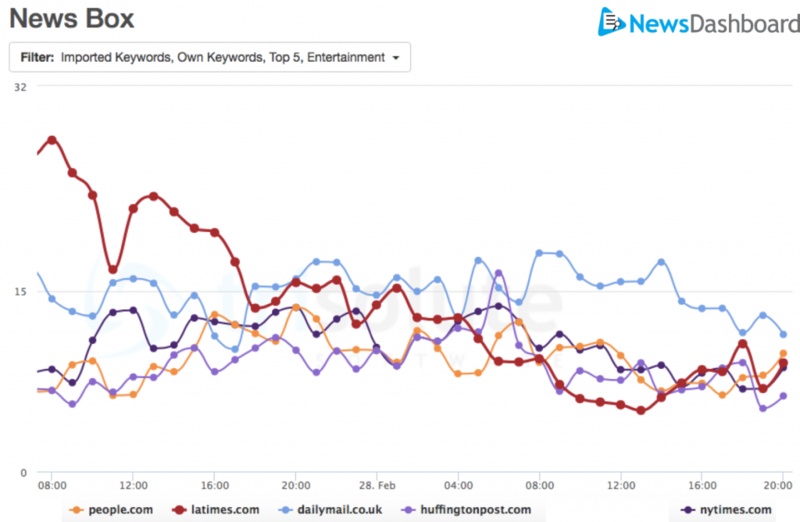 Hollywoodreporter.com and dailymail.co.uk again position themselves on the stage as second and third best. But this time they alternate in these positions a lot more and it is impossible to say who takes the cake. Their nearly shared maximum is reached on Saturday with a value of just above 33 percent visibility. Eonline.com are on fourth position with lower scores under twenty percent for Friday and Saturday and scores above 24 percent for the following three days. 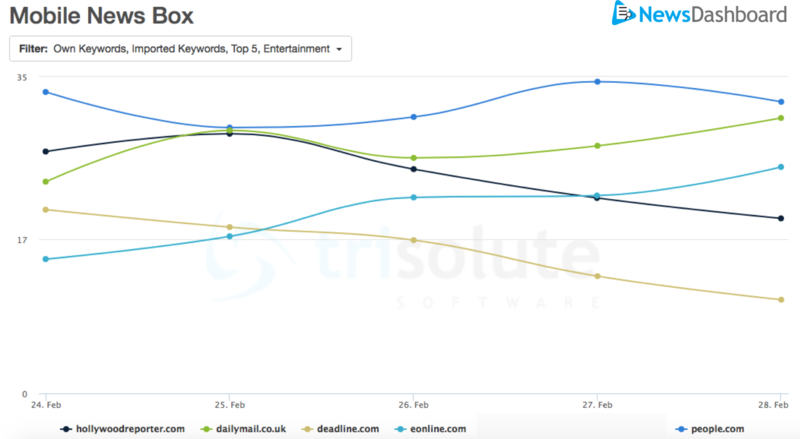 Last but not least in the top 5 is deadline.com – they start off incredibly strong with 26.65 percent and on third position on Friday, but they lose their leading position and drop steadily down to 12.25 percent on Tuesday. To take the extra step we want now see the placement in the single-source carousels or Publisher Carousels and see how much visible impact these had in general. Again, we will look at the five-day-view. About a sixth of all mobile news relevant SERPs also consisted of one or more Publisher Carousels. 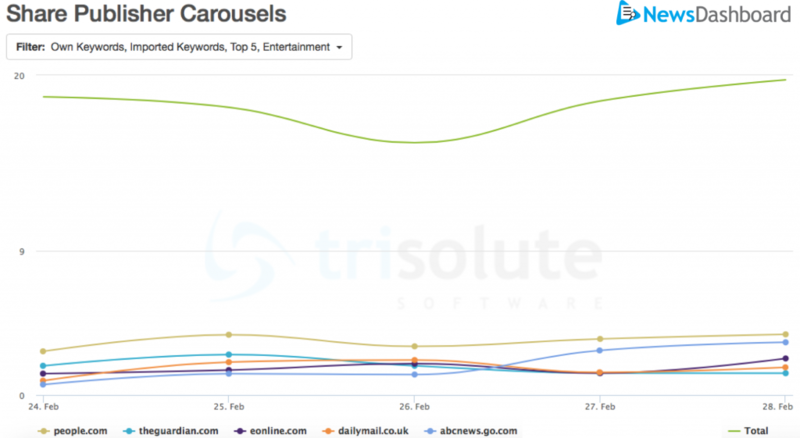 Publisher Carousels were part of 15 to 20 percent of all Oscar and entertainment related monitored mobile SERPs. They had their least visible day on Sunday and were most visible on Tuesday. Most single-source carousels go to – to no surprise – people.com. Keep in mind that there is no clear inside yet if and how visibility scores in AMP carousels and a share or ranking position in single-source carousels are related, but there seems to be a slight overlap at least in this case. Also, there can be more than one Publisher Carousel on a single mobile SERP. The single publishers all reach visibility scores between 0.66 percent and 3.80 percent at most. The rest of the field is pretty divided. While until Sunday theguardian.com, eonline.com and dailymail.co.uk are strong, they all fall flat together to an equal score and abcnews.go.com takes a huge leap with their visibility scores. For our last part we will look at some coverage after the event in the desktop News Boxes. Latimes.com start of very strong in the desktop News Boxes, but the field progressively evens out. As we look on the desktop news Boxes, we see some different faces in comparison to the mobile SERP results. Surprisingly, latimes.com starts Monday with a visibility of nearly 28 percent at 8 am. Unfortunately, their visibility shrinks severely and they are down to values around 5 to 11 percent on Tuesday afternoon. Dailymail.co.uk is again very strong. They stay constantly on the top ranks throughout the day. They never drop below 10 percent, but they also never go over the 20 percent mark. The other three contestants in the top 5 are people.com, huffingtonpost.com and nytimes.com. They stay close together through the day and reach their maximum potential throughout the night and early hours. British publishers as theguardian.com (Publisher Carousels) and this time especially dailymail.co.uk (desktop and mobile visibility) peak in their visibility in the USA and also in other countries. But, people.com, was the best overall publisher for this entertainment event. Other entertainment related publishers as hollywoodreporter.com, eonline.com and deadline.com were also strong for mobile visibility. For desktop visibility we have some more traditional news outlets like latimes.com, nytimes.com, as well as huffingtonpost.com and again people.com and dailymail.co.uk.